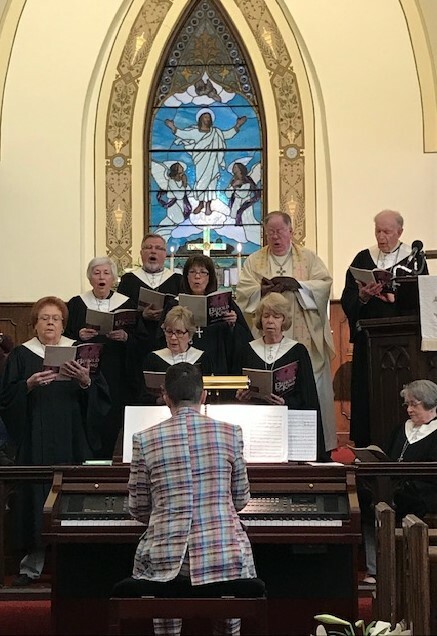 The choir performed John W. Peterson’s Easter cantata, “Behold Your King,” on Sunday, led by Music Director Joey DiGuglielmo on piano. 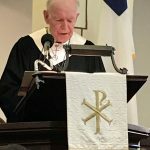 Harvey Reisenweber narrates by reading passages of the Easter story. 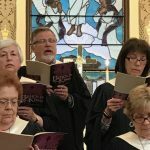 Pastor Tom Hartshorn was one of three soloists in the Cantata. 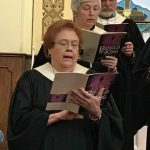 Mary Kackley sings a solo. 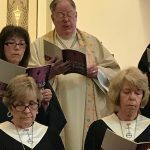 Bob Gough was another featured soloist. 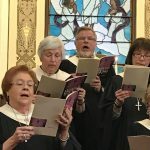 Mary Kackley and Bob Gough sing a duet. 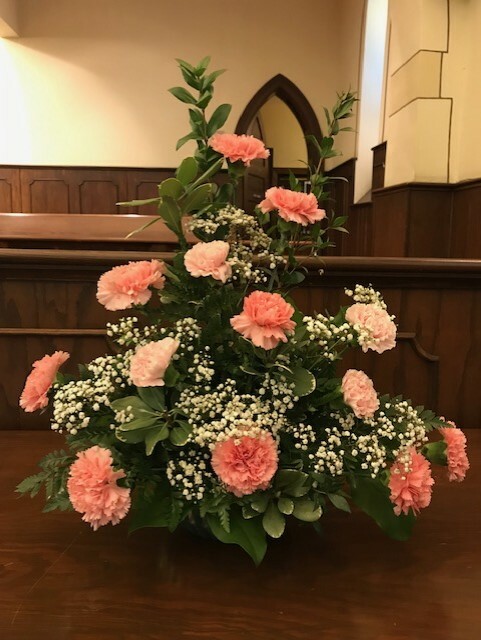 These lovely flowers were in the sanctuary on March 3 from Brian, Cathy and Zachary Grant, to honor and remember their parents, Norma and Allen Grant. What a wonderful reminder of two long-time members of our church family who are so deeply missed. 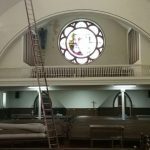 Repairs in the sanctuary are completed! 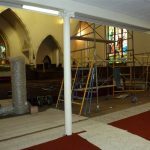 As these photos show, the carpet was replaced, plaster work and painting in the balcony area was done and the stairs beside the altar were fixed. Peeling plaster is being repaired in the balcony area before painting. 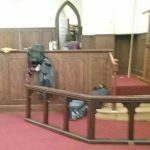 Progress is made on the stairs and carpet in the sanctuary. Installment of new carpet is nearly completed. 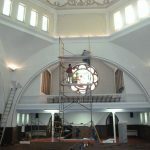 Our construction team began repairs in the sanctuary in January. The Property Committee thanks everyone in the congregation and our visitors for your patience and cooperation! 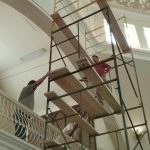 Scaffolding is put up to begin repairs in the sanctuary. 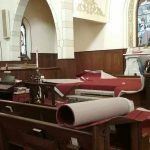 The old carpeting in the sanctuary is being removed to make way for the new! 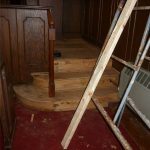 Side steps by the altar are being repaired as well. Crews on scaffolding work on lights and make other repairs. 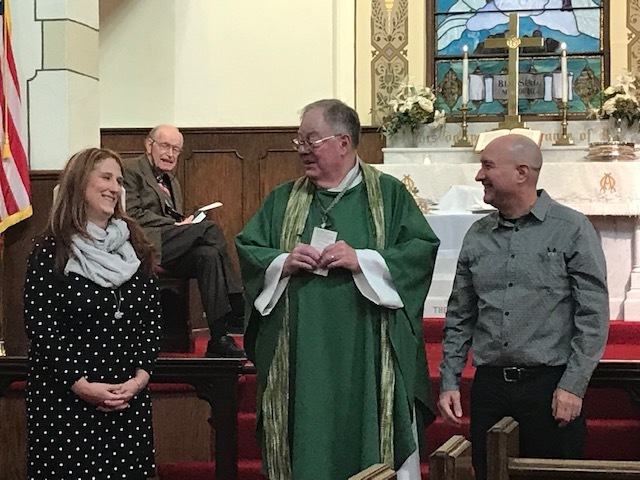 On Jan. 6, we welcomed new members Denise Phelps and Mark Eisinger, shown here with Pastor Tom Hartshorn. We are so happy you have decided to join our church family, Denise and Mark, and we look forward to getting to know you better. Welcome! ‘Neighbors in Need’ Table is open with donated clothing, blankets, sleeping bags, etc. NOTE: * Cancelled if there is bad weather!